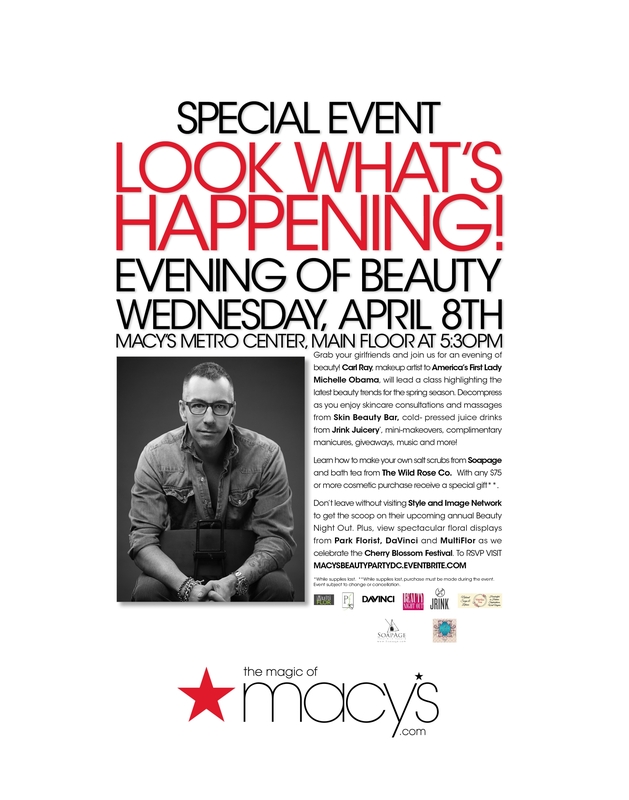 SPECIAL EVENT: Evening of Beauty with Macy’s Metro Center and Carl Ray! Wednesday, April 8th, 2015 at 5:30PM. Grab your girlfriends and join Style & Image Network for an evening of pampering at Macy’s Metro Center on Wednesday, April 8th at 5:30pm. Carl Ray, makeup artist to America’s First Lady, Michelle Obama will lead a class highlighting the latest beauty trends for the Spring season. Decompress as you enjoy skincare consultations and massages from Skin Beauty Bar, cold- pressed juice drinks from Jrink Juicery*, refreshments, mini-makeovers, complimentary manicures, giveaways, music and more! Learn how to make your own salt scrubs from Soapage and bath tea from The Wild Rose Co. With any $75 or more cosmetic purchase receive a swag bag* filled with goodies. Don’t leave without visiting Style & Image Network to get the scoop on their upcoming 8th Annual Beauty Night Out event. Plus, view spectacular floral displays from Park Florist, DaVinci, MultiFlor, as we celebrate the Cherry Blossom Festival. Event subject to change or cancellation. *While supplies last. **While supplies last, purchase must be made during the event.